Henderson, the second largest city in Nevada, is also one of America's fastest-growing communities. In fact, the population increased 44% from 2000 to 2008 (to 252,000). Henderson is home to Touro University Nevada and Nevada State College.There are several reasons why Henderson is an appealing college-town community. For one, the colorful desert landscapes and the snowcapped peaks of nearby mountain ranges provide a dramatic backdrop for this city near Lake Mead. For another, active individuals will like that Henderson has the highest ratio of parks and recreation facilities per inhabitant than any other city in Nevada. The city has a diversified economy featuring high-tech industries along with a booming service sector. And lastly, the city prides itself on its master-planned residential areas, transportation projects, and outstanding recreational opportunities. Henderson began as a magnesium procession center in the 1940’s. Now it has been discovered as a great place to live with a moderate winter climate. Outdoor activities are plentiful in the area, including the scenic mountains. Henderson is located in Clark County. The city of Las Vegas is just 5 miles away. Photo of "Black Mountain" courtesy of Wikipedia and Spitwater. You can live in one of the many developments, some of which are active adult and many of which are open to all ages. 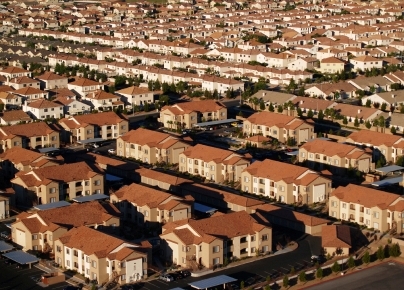 In 2010 the Las Vegas real estate is one of the 3 worst markets in the nation. Foreclosures were depressing prices in this area. According to the National Association of Realtors (NAR) the Las Vegas Metro median selling price in late 2012 was about $146,300. But by the last quarter of 2018 it reported the median selling price in the Las Vegas-Henderson-Paradise area to be $295,100, up 10% from the previous year. Henderson is located on the southern edge of the Las Vegas Valley at 1904 feet above seal level. It is just a few miles from Las Vegas and fairly near the Hoover Dam. It gets 4.5 inches of rain per year. The McCullough Mountains run through the area. Summers are extremely hot, winters are mild. The average July high is 107 and the average January low is 37. There are several casinos in town that provide entertainment possibilities. The Henderson Events Plaza provides cultural events such as the Water Street District Arts Festival. Needless to say there is plenty going on in nearby Las Vegas. The crime rate in Henderson is about half the national average. McCarran International Airport is 4 miles away in Las Vegas. There is a bus station in nearby Las Vegas. Henderson is below average in walkability when compared to other cities.